Obituary – Andrews, Willard William « Perry High School Alumni Association, Inc.
– 18 year old son of John F. Andrews, Route 3. Perry. He was born in Perry July 16, 1921. Before attending the Perry schools, he attended school in Blackwell. For the past two years he has played the position of guard on the basketball team. He is a member of the local chapter of the Future Farmers of America. Baseball is his hobby. Willard Andrews, 82, Perry, Thursday, Feb. 12, 2004, in the Perry Memorial Hospital. Services will be 1 p.m. Saturday in the Christ Lutheran Church. The Rev. William Metz will officiate. Interment will be in Grace Hill Cemetery. Services are under the direction of Brown-Dugger Funeral Home. He was born July 16, 1921, in Perry to John and Stella Andrews. He was a building and paint contractor in business for himself since 1951. After graduating from Perry High School he attended Oklahoma A & M in Stillwater where he was a member of the R.O.T.C. 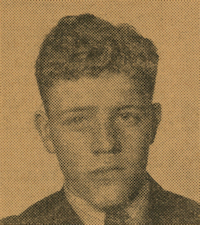 In March of 1941 he was a member of the CCC Camp in Blackwell. He served in the Army from 1942-45, spending 31 months on the French owned island in the South Pacific called New Caledonia. He was a member of the baseball team and football team on the island. The football team, called the “Greentide” won the championship on the island. June 20, 1947, he married Betty of Perry. He was past president of the following organizations, Perry Camp Fire Council, Shooting Star Square Dance Club, Perry Bowling League Association, Christ Lutheran PTA, Perry Band Boosters and chairman of Christ Lutheran congregation. He was a past president of the men’s club of Christ Lutheran Church of which he was baptized and became a member in July 1947. 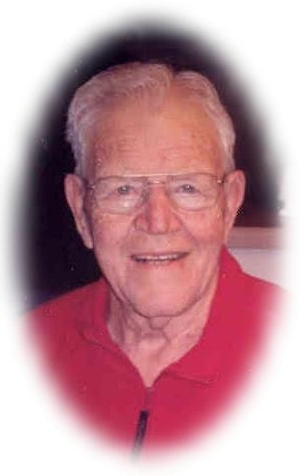 He was church elder, church treasurer and junior youth counselor, was chairman of the Christ Lutheran School building committee and a member of the building committee of Christ Lutheran Church. He served as president of the Perry Hospital advisory board and was a board member for several years. He served on the board of directors of the Perry Golf and Country Club, serving as president on six different occasions; he also shot a hole-in-one there. He was president of the state bowling board of directors, was on a Perry bowling team for many years and his team was the only team from Perry to ever win first place in the state bowling tournament. He is listed in the Bowling Hall of Fame and Museum in St. Louis, Mo., for bowling a perfect 300 game. He was pitcher for the Lutheran softball team and coached Little League baseball. He played on the American Legion softball team and Scovill Tire team and an independent basketball team for many years playing against teams such as the Harlem Globetrotters and The All-American Redheads. He served as commander of the American Legion and head of the Selective Service board for five years receiving several certificates of appreciation from the president. He was a past member of the Rotary Club, a 60-year member of the American Legion and a charter member of the Elks. He was an enthusiast of all sports and an avid bowler, golfer and fisherman and was elected commander of the 493rd Engineer Alumni Group. With all his material honors, the main thing was that he was a Christian. He loved God, his family and many friends. He is survived by his wife of the home, six grandchildren and a great-grandson, his daughter-in-law and son-in-laws, a sister and her husband, many nieces, nephews and a host of friends.